When we last left Sabrina Spellman (Kiernan Shipka), she had officially dedicated herself to the Dark Lord in order to save her town from the vengeful ghosts of the Greendale Thirteen. Soon after, an even-blonder Sabrina severed ties with her mortal friends — including her relationship with dreamy Harvey Kinkle (Ross Lynch). Meanwhile, the demon-possessing Mrs. Wardwell (Michelle Gomez) revealed herself to be Madam Satan, the hopeful/future Queen of Hell. Coming to Netflix this December, the episode (titled “A Midwinter’s Tale”) picks up not long after the first season — which began just before Halloween and continued through Thanksgiving — concluded. There will be some progression for Sabrina‘s story overall, but the episode will primarily focus on the holiday spirit(s). Similar to the show’s fictional holiday Feast of Feasts, the Church of Night’s celebration in place of our turkey-centric holiday, the new episode will teach us what the witches and warlocks of Greendale do to celebrate the festive season while we deck the halls and light menorahs. To commemorate the winter solstice — the longest night of the year — families sing pagan carols and tell ghost stories around the Yule fire, and guests, both welcome and not, come by to join the festivities — but, of course, there’s a chilling twist: “You never know who’ll drop down the chimney,” Netflix warns. We can count on regulars Sabrina, Aunt Zelda (Miranda Otto), Aunt Hilda (Lucy Davis), Ambrose (Chance Perdomo), Mrs. Wardwell, Harvey, Rosalind (Jaz Sinclair), Susie (Lachlan Watson), Prudence (Tati Gabrielle), Agatha (Adeline Rudolph), and Dorcas (Abigail Cowen) all showing up. Mckenna Grace will play Li’l Sabrina when viewers will get a chance to see what the character was like as a youngster. While the Church of Night celebrates the Solstice, that won’t stop young Sabrina from asking for something special. Alexis Denisof will recur as Mary Wardwell’s boyfriend, Adam Masters. Handsome and charming, Adam returns to Greendale after a stint overseas working with Physicians Without Frontiers — unaware that his fiance has been taken over by the demoness Madam Satan. Jedidiah Goodacre will recur as warlock Dorian Gray. The owner of Dorian’s Gray Room, an exclusive nightclub, this enigmatic gentleman of an indeterminate age is very good at keeping secrets, especially his own — a cursed portrait he hides from prying eyes. 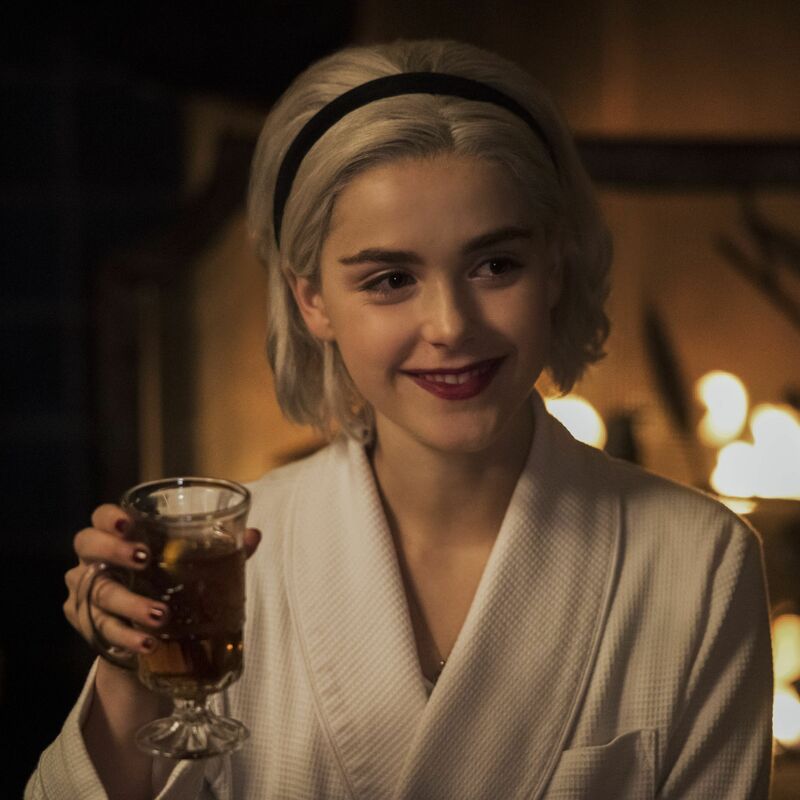 Browse more photos from the episode below and prepare to make your holidays a little bit chillier when Chilling Adventures of Sabrina: A Midwinter’s Tale hits Netflix December 14. ‘Fortnite’ cross-play comes to PlayStation. This is huge.